The church of St Mary’s in Stotfold is situated towards the east of the town of Stotfold. 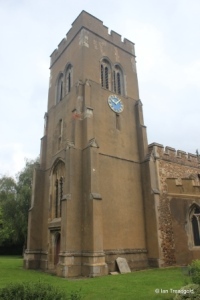 The church is accessed by road via a track from Church Road with parking available in the church car park. The church consists of a nave and chancel, north and south aisles, a south porch and west tower. 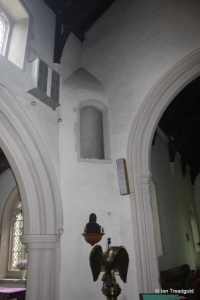 The chancel is around 40 feet by 15 feet with the nave adding around 47 feet with a width of around 21 feet. 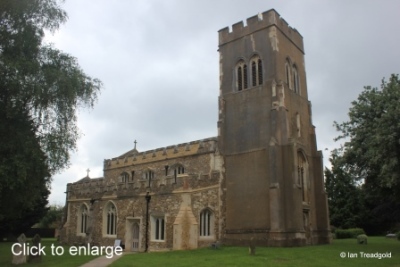 The north aisle is around 10 feet wide whilst that on the south is some 13 feet wide. The tower is around 13 feet by 12 feet and around 40 feet high. 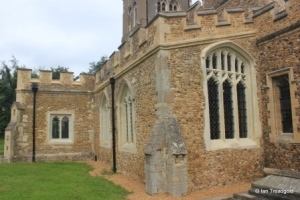 The building has origins in C12 when it was an aisleless church with a nave and chancel. A north transept chapel was added in the early years of C13 and this was extended to form the north aisle. 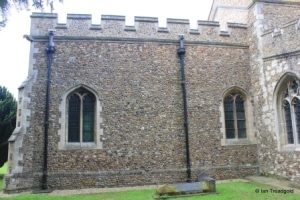 The south aisle was added during C14 with the tower following in C15. 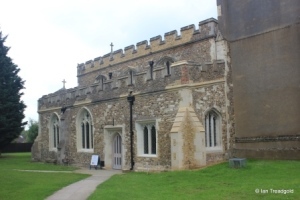 The chancel was rebuilt in C19 with the addition of an organ chamber on the south side. 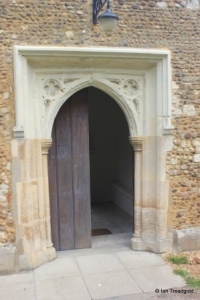 The north doorway was remodelled in 2014 to allow disabled access and extensive external restorations to large parts of the upper stonework took place in 2017. The chancel was rebuilt with cobbles as part of works in 1890 and the organ chamber added to its south side. 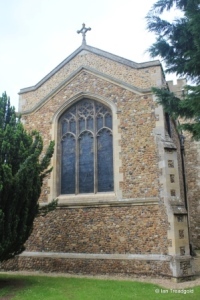 The chancel has two windows to the south with no doorway. 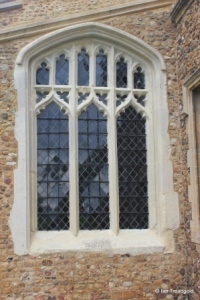 The eastern window is in C15 style and of two cinquefoiled lights with a quatrefoil design above under a four-centred arch. 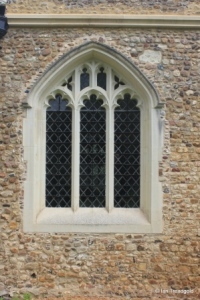 The eastern window is a single cinquefoiled light under a square head. The south aisle has windows to the east and west and three facing south, two to the east of the porch and one to the west. 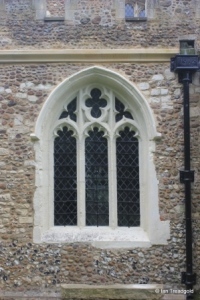 The east and south facing windows in the south aisle have all been restored and are of C15 style. The east window of the south aisle is of three cinquefoiled lights under ogee arches with perpendicular tracery above under a four-centred arch. 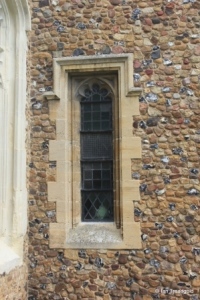 The three south facing windows are all similar, each with three cinquefoiled lights with some perpendicular tracery above under four-centred arches. 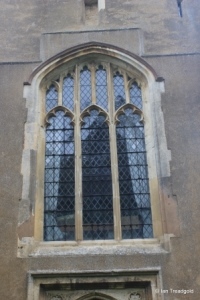 The west window of the south aisle is of early C14 style with two cinquefoiled lights and a cusped spherical triangle above under a two-centred arch. 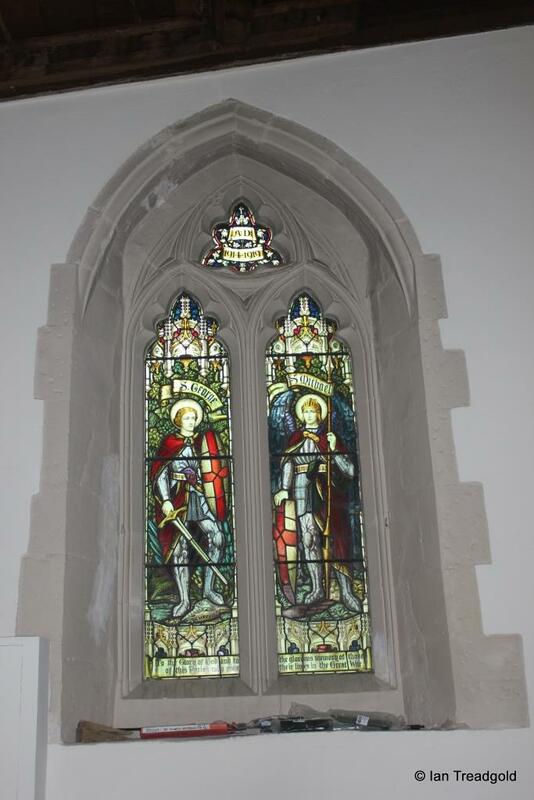 The glass in this window depicts St George and St Michael and remembers those who lost their lives in the Great War and was erected in 1920. The south porch has windows to the east and west, each of two cinquefoiled lights under a square head. 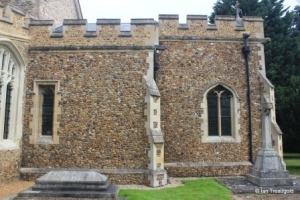 The porch, like all the church, has an embattled parapet. 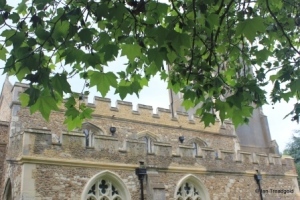 Although some of the parapet over the clerestory and chancel was only added in works in the late C19. The doorway has a two-centred arch with a square head above and quatrefoil designs in the spandrels. 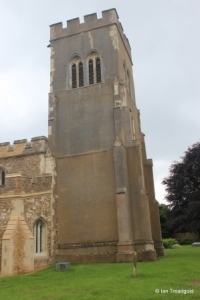 The west tower was restored in 1927/8 and is of three stages and rendered in contrast to the main body of the church except for the west end of the south aisle. The belfry lights are of conjoined pairs of two cinquefoiled lights with quatrefoil designs over under two centred arches. 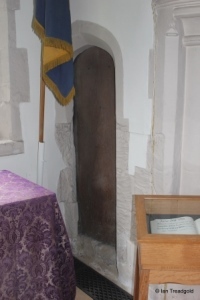 There is a clock face to the south dating from 1910 and placed there in memory of Revd John Holding. 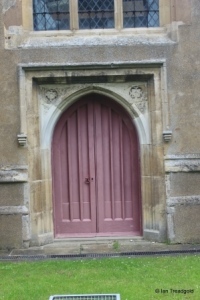 The west door is under a two-centred arch with a square label above with quatrefoil designs in the spandrels. 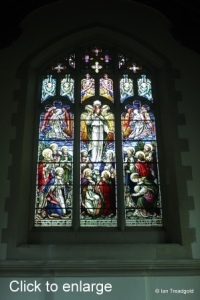 The west window has three cinquefoiled lights with perpendicular tracery over under a four-centred arch. 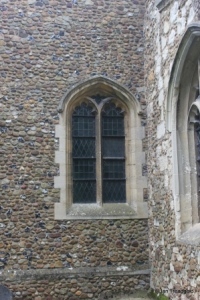 The north aisle has a similar number of windows to that on the south with windows to the east and west and three to the north, one to the west of the north door and two to the east. The clerestory over has three three-light windows under four-centred arches. The west window of the north aisle has three cinquefoiled lights under a four-centred arch. 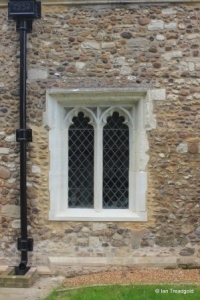 The masonry around the window shows the clear change in the roof angle. 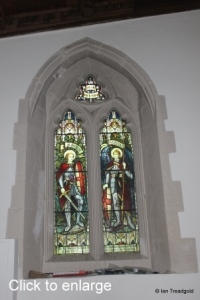 The western window of the north aisle is of two cinquefoiled lights under a square head. 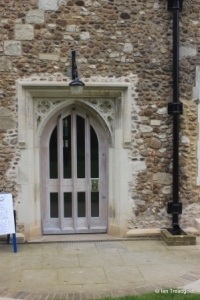 The north door has quatrefoil designs in the spandrels under the square head. 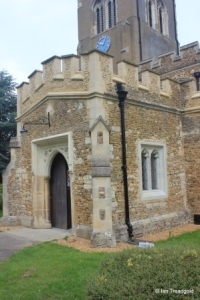 The north porch that originally stood was removed in the late C19 restorations. The current door and pavement outside were improved in works done in 2014. 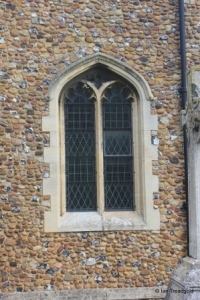 The two eastern windows of the north aisle are of the same style with three cinquefoiled lights under two-centred arches with trefoil and quatrefoil designs in the tracery. 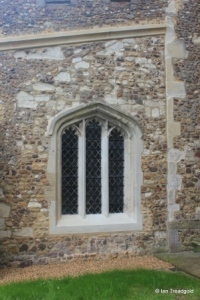 The east window of the north aisle is similar but has not been restored in recent times. 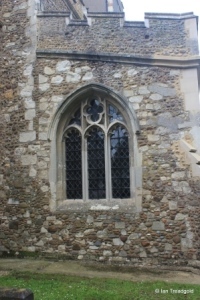 The north side of the chancel has two windows at the east and west extremes of the chancel. 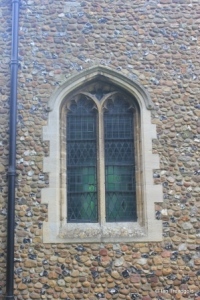 Both windows are the same as those on the south side of the chancel with two cinquefoiled lights under four-centred arches. 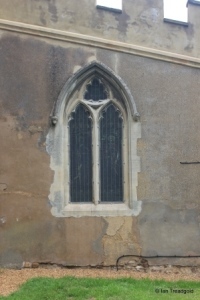 The east window date from the rebuilding of the chancel in the late C19 and is of three cinquefoiled lights with perpendicular tracery over. 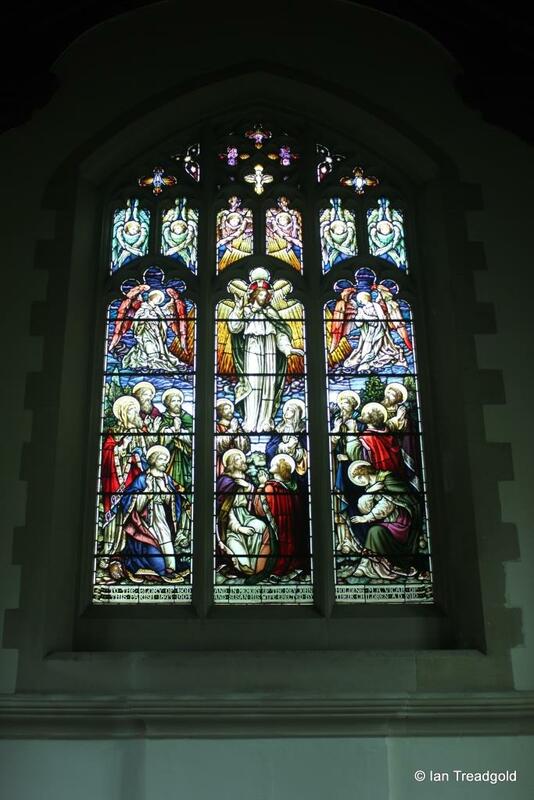 The glass dates from 1910 and is in memory of Revd John Holding who was vicar between 1893 and 1904 and his wife Susan. 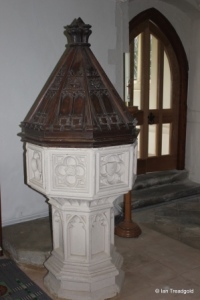 The font, in the south aisle, date from C14 and is octagonal with quatrefoil designs in the panels of the bowl and has a panelled stem. The rood loft was removed during C17 although the stair remains with openings in the north aisle and over the chancel arch.